The Suwannee River flows thru south Georgia and north Florida and ends in the Gulf of Mexico. it is origin is near the Okefenokee swamp in south Georgia. Suwannee River, everyone has heard of it due to the historical song by Steven Foster, but few really know anything else about it. It starts in southern Georgia at the Okefenokee swamp and meanders its way some two hundred and sixty six miles thru Florida to the Gulf of Mexico, gaining in size along the way due to ...Learn more here! The Suwannee River flows thru south Georgia and north Florida and ends in the Gulf of Mexico. It's origin is near the Okefenokee swamp in south Georgia. Suwannee River, everyone has heard of it due to the historical song by Steven Foster, but few really know anything else about it. It starts in southern Georgia at the Okefenokee swamp and meanders its way some two hundred and sixty six miles thru Florida to the Gulf of Mexico, gaining in size along the way due to two major tributary rivers, the Santa Fe and Withlacoochee, along with some two hundred and twenty crystal clear springs. Some are under the river and will only be seen by divers and artifact hunters, but the really big ones you can drive your boat into. Some able to hold a hundred boats, like a big crystal clear swimming pool where young and old play together. Pontoon boats with their bar-b-q grills going, go fast. Boat clubs from all over Florida and Georgia will be there, especially on major weekends. and all the local colorful characters. The Suwannee offers about one hundred miles of good boating and the Santa Fe about another ten to the Ichetucknee river. If you are a sportsman, naturalist, want a good investment or just want a place to get away from it all, you'll love it here. 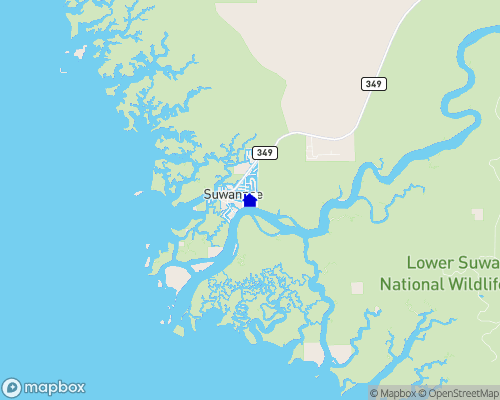 The Suwannee River is a federally designated wild river. It is the only major waterway in the southeastern United States that is still unspoiled. The Suwannee flows from the Okefenokee Swamp in southern Georgia to the Gulf of Mexico in Florida. It winds for almost 266 miles through swamps, high limestone banks, hammocks of hardwood, and salt marshes. It also has fifty-five springs along the way. The river’s limestone outcroppings and a drop in elevation create Florida’s only whitewater rapids at Little Shoals and Big Shoals located several miles upstream from the city of White Springs.